I thought today would be a fine day to re-enter into the blogging world. The air outside is crisp, we've had our first (and second) snowfall, and as the temperature continues to drop and the days become shorter, all thoughts turn to knitting. Today is also a fine day to re-enter into the blogging world because today is my birthday. I have officially reached the quarter-century mark and oddly enough, I feel quite young because of it. Last year when I turned 24 I felt so old and nervous because I thought 24 sounded like a very serious age and I wasn't ready for that. Of course, at that point I was still working on my Master's degree and was surrounded all day by young undergrads fresh out of high school, so that may have had something to do with it. After my last post at the beginning of July, my scenery has changed quite a bit and with it, my perspective. I moved back to Minnesota a few months ago (so long Pittsburgh, it was fun!) and immediately began the stereotypical life of an unemployed musician - working part time at a coffee shop. I do really enjoy that job, despite the 5am call time, because of all the interesting and diverse people I get to meet. Lately I have also been subbing in a number of orchestras in the area and each time I show up to rehearse, I observe that I am the youngest person there. It's this change in daily interaction that makes me feel young at 25 when I felt so very old at 24. I am no longer surrounded by children of the 90s, but working adults with much more experience than I have been able to gain in my time. I suppose it's a welcome feeling. Enough of that, this is a knitting blog after all. There are a number of reasons why I haven't been blogging lately that I won't go into, but one of them is that I haven't been able to show you any of the projects I've been working on. Ever since I moved back to MN at the end of July, I have been a bit inundated with sample knitting for various designers. (The fault is all mine, I have a problem with saying "no.") Though my needles have been rhythmically clicking their way through countless sweaters, scarves, shawls, and other accessories, I can't show you any of them and have been left rather starved for blog content. However, as a birthday gift to myself and my sanity, I have decided not to say "yes" to any more sample knitting for a period of time, which will allow me to spend my free time doing whatever I want - knitting, spinning, reading, or (and this is quite new) weaving. I just need to finish up the last of my samples and I'll be good to go. I did sneak one simple little project in there with everything else. I couldn't resist. I had been in dire need of something mindless and this ball of Kidsilk Haze Stripe was staring me in the face. On the ball band is a simple 1-ball scarf pattern that has proven to be quite popular and it is exactly what I needed. I had never knit with Kidsilk Haze before (I made an attempt back in 2008 and very quickly put it in the "we will never speak of this again" file), but it turns out it's really not difficult. It's really just like knitting with any other yarn. Who would have thought? I didn't get any good photos of the finished project because I was in a bit of a rush when it was done. I had plans to meet a good friend for dinner and decided that this scarf would be perfect for her, only it wasn't finished yet. I spent the day knitting away and finished the scarf 15 minutes before I was supposed to meet her at the restaurant. I gave it a nice steam, blew on it for a bit (because clearly that helps it dry faster), and wrapped it up on my way out the door, pausing briefly to throw it down for a few quick photos. I have to tell you guys something about these scarves, though. When you finish, you will immediately want to begin a second one. It's almost guaranteed. The only thing that stopped me was my lack of a second ball of this stuff and the two sweater deadlines jabbing me in the back with their addis. I did trip up once and went to the yarn shop to find more yarn, but the kind workers must have known my situation and hid all the good colorways before I got there so I wouldn't be tempted. The colorway you see here is 204 and also the only one that I might be able to pull off wearing as a man. I am envisioning an impossible number of exciting projects in my future and will be sure to keep you all in the loop. It's gonna be great. 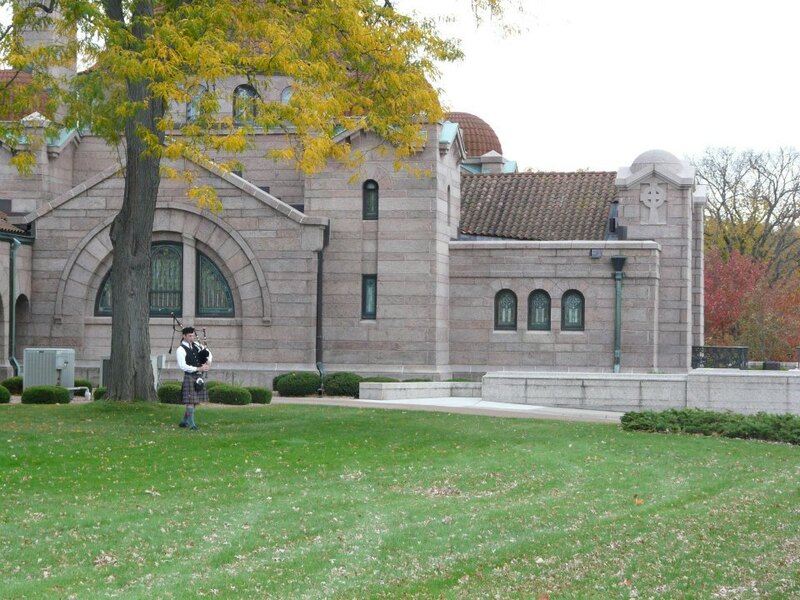 I'll leave you with an unrelated picture of me playing the bagpipes outside of a church. I played for my brother's wedding in October and was warming up outside when this picture was candidly taken. I didn't even know anyone else was around, but I love the picture. Now I want to head to the LYS and find stripy KSH! It's good to hear from you Peter. Happy Birthdayyyyy! I missed you and I'm very glad you've come back to blogging. At 28 I feel both young and old at the same time, and I can say that I'm finally comfortable in my own skin. Nice to hear you're experiencing the same. Happy birthday, young man! I'm so glad to see your blog show up again in my reader, and I'm happy to see that you're doing well. Being able to accept each 'age of man' is a gift, and I'm glad that you're embracing 25. It's a good age. And shouldn't there be birthday pictures? A mug shot to mark the quarter century? Happy Birthday! I remember feeling nice and young when I turned 25, but now that 26 is creeping up I feel old again... hope the feeling lasts. When do you get to finally show off your samples? Happy Birthday!! It's nice to see a new post from you. I've somehow gotten old without realizing it - I'll be turning 30 in the spring, I have a kid who is only 10 days away from being a year old, the freshman I'm teaching are over a decade younger than me...when did this happen? And when am I actually going to feel like an adult? Are you ever going to get to show us the samples you knit? I'm so curious! Happy birthday! I never manage to read my blogrolls anymore, but I can always make time for you. Yeah, and what's with the distance shot of the kilt wearing? You know we want to ogle your kilt hose. I hope MN is treating you well. Write again soon. Blog reading and writing is sure on the downswing, I think for all of us.. Happy belated! Nice to see you posting again. Happy Birthday!!! a wee bit late. Yay! Peter's back. You have definitely taken a long hiatus from the blogging world. Happy belated Birthday! I hope you had a beautiful day! The scarf that you knitted is cute. I like it. It's also exciting that you are trying weaving. I have always wanted to do that. I hope you are successful in finally securing a posting in an orchestra, because I know that is your heart's desire. May good fortune smile on you! Take care Peter and Happy Knitting! I look forward to reading about your knitting adventures, but it is enjoyable hearing about what is going on in your life. I wish you all the best! Happy Birthday! When I was a teenageer, I remember thinking 25-year-olds seemed mostly directionless. When I was 25, I was mostly directionless. Here's to a better track record than most of us.